For my dress, its a beautiful vintage dress from England. I really don't remember the price, but lets just say it's a designer dress and it wasn't cheap. It's a deep blue with a white floral pattern with leaves. I really think that this dress is classy and has a older appearance to it do to the high neckline and sleeves. It's what makes me adore wearing it. It also has slight padding on the shoulders which makes me love it even more! SHOULDER PADS! ahah. I also wore sheer black tights to have a more modern feel to my outfit. And because I love wearing tights :). For shoes, I wore my black suede 6 inchers I bought from StyleSense 2 years ago. They are surprisingly comfy to wear and easy to walk in. I consider them my party shoes! I just love wearing them unexpectedly to places. But honestly, I don't like wearing them when I know there are a lot of people around, like in large public areas. I feel very self-conscience about it and makes me feel a little uncomfortable feeling so tall. I know, it's a bit weird, but that's just me. I wear them only around my closest friends. I wore my nearly-everyday birdy necklace from H&M and gold cross earrings from FOREVER 21. Nothing special because I didn't want to take away from the dress. 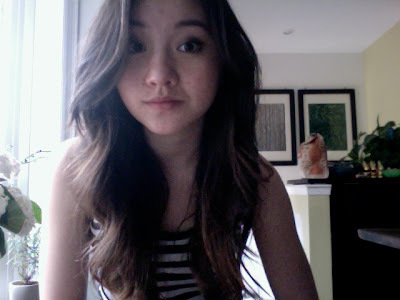 My hair was parted in the middle, like usual, and curled loosely for some loose waves. The top part of my crown was also clipped back with a clear hair clip. Nothing special again. Just wanted to create something that was soft and natural. And VOILA! My outfit of the night! I had a lot of fun last night, and great food to eat! I was stuffed. You've just been Pitch Slapped! Hello Hello! And Welcome to my Blog! All content copyright © 2012 Aine ONeill. Travel theme. Powered by Blogger.